This Easy and Healthy Berry Cobbler recipe is my new favorite Summer dessert. 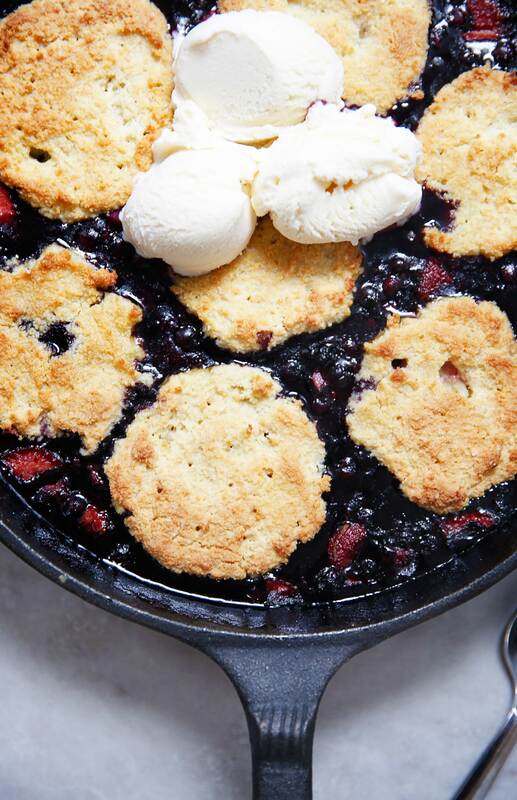 This healthy cobbler recipe is packed with fresh or frozen berries and topped with the best gluten-free biscuits. It will be your favorite dessert of summer! Think Summer cookouts, 4th of July, Memorial Day, and Labor Day! Everyone will love this paleo berry cobbler. It’s a perfect one-skillet dessert that’s easy to prepare, and can be devoured by a crowd! You will be in love with our homemade paleo biscuits, too! Can you use frozen fruit instead of fresh? Yes, you can, but with some adjustments. Can you sub other fruit, like peaches? Make biscuits: In a bowl, stir together dry ingredients. Add in cold cubed butter and using a pastry cutter or your fingers break up the butter into the flour mixture until it is in small pieces. Add in applesauce, egg , and butter and mix to completely combine. Using your hands, roll dough into 6 balls and then using your hands pat the balls into a biscuit shape about 2-1/2" in diameter and set aside. In a large bowl mix together the blueberries, strawberries, lemon zest and juice, arrowroot, lemon and sugar until well combined and pour into a 9 x 13 inch baking dish or large cast iron skillet. Top berries with the the biscuits. Sprinkle biscuits with extra sugar if adding. Cover lightly with foil and bake for 20 minutes. (See note on how to cook frozen fruit) Remove the foil and bake for an additional 20 minutes. Serve warm with a big scoop of vanilla bean ice cream! Can you omit the arrowroot? It helps thicken the berry mixture! It will be watery without. You can use a mix of other berries, too!! If cooking with frozen fruit, bake an extra 10 minutes uncovered. The amount of the strawberries is not listed in the ingredients. How many cups? All fixed 🙂 So sorry! The directions reference placing the blueberries and the strawberries in a large bowl however there are no strawberries in the list of ingredients. Are there strawberries in this dish or not, and if yes, how many cups of strawberries to add. Do you put the biscuits in the skillet as balls or do you cut or press them into biscuit shapes first? Shapes first – updated this! What happens if I don’t sift the flour? No it’ll be fine as long as it’s fine almond flour. 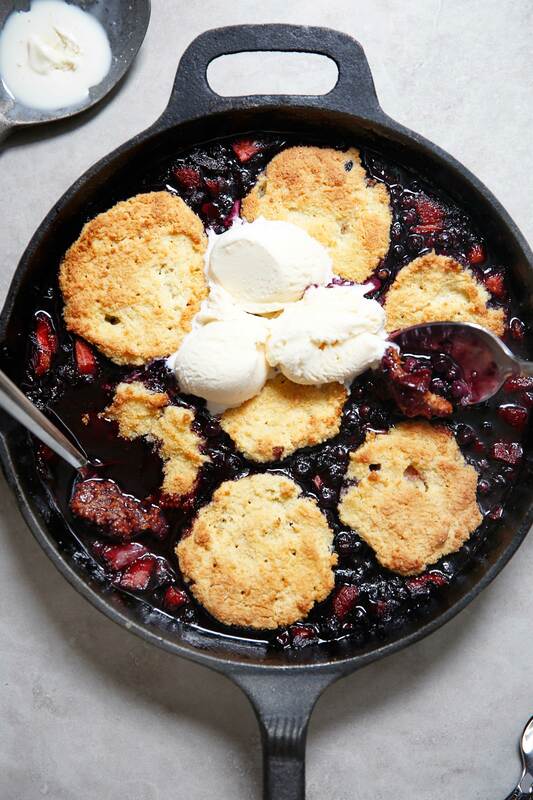 This cobbler SCREAMS July 4th! This looks amazing! I’d love to make this. It’s not summer without cobbler! Love this healthier version! This is a summer dessert must-make! So easy and looks delicious! This is AMAZING!! The biscuit top part is nice and crisp and the warm berries, it took us serious self control to not devour the entire cobbler!!!! Coconut sugar jnst as of maple?? Loved this recipe and my son has asked me to make it both times he has been home. Question for you…is it possible to just make the biscuits by themselves? And would you just put them into a pan to bake?